You will feel right at home at West Chester Family & Cosmetic Dentistry as we welcome all patients as if they were family. When you arrive in our reception area, you'll be greeted by name from Debbie. The short wait is relaxing and with the soft lighting and the aroma of fresh candles, you know this isn't a typical dental office - Welcome to your new dental home. Today’s dentistry is quick, convenient, and often painless. Modern technology is largely accountable for the impressive advances and improvements in dentistry. We strive to lead and provide the same cutting edge technology to our patients. 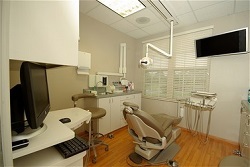 Our treatment rooms are state of the art supplied with the latest technology. Dr. Maheswaran Sanjeevan was born in Sri Lanka (a tiny island south of India) and moved to Canada at an early age. He opted to do his residency at The Ohio State University and has been calling Ohio home since 1998. In his free time he likes to race cars, golf, travel and enjoys photography. He has been married to his lovely wife, Akalya, since 1998. Dr. Sanjeevan has been practicing dentistry for over 13 years. He makes it a priority to stay current on many continuing educational classes, including advanced cosmetic dentistry, ensuring that his patients receive the most comprehensive and advanced dental care.